Project #1: Sculpture crafted directly in wax cast using the lost wax ceramic shell technique. Description: Students will create a wax sculpture then invest and cast it in bronze. Students will use a variety of techniques for working with wax. The main form will be made by casting and combining two hollow wax shapes cast from plaster molds then a combination of additive or subtractive techniques will be used to create their sculpture. The sculpture will then be cast in bronze using the ceramic shell method. The final piece will be chased (the surface finished) and patinated (colored and sealed). Purpose of assignment: Learning all the techniques necessary to produce and cast a bronze sculpture using the ceramic shell technique (wax sculpting, sprueing, investing, chasing, finishing, patination and mounting). Grading: Pieces will be critiqued and discussed, emphasizing technique and finish, rather then concept and design. Grades will be based on the following: 75% design, technique and finish that will include wax formation and manipulation, metal finish, patination, presentation; 25% of the grade will be on concept and creativity. a.	Soak the plaster mold in water until it no longer bubbles (at least 20 minutes). b.	Pour out the water and blot up any excess from inside the mold with a towel. c.	Place the mold on a level surface and pour wax into the mold until it is level with the surface (if possible, do this in one pour rather then several small ones). The wax should be molten, but not too hot (around 160-180°F). d.	Wait until the wax hardens around the sides of the mold. The hardened wax should be about 3/16”-1/4” thick. This will take a minute or two depending on the temperature of the wax. You can check by scraping off the wax flush with the top edge of the mold. e.	Pour out the molten wax. f.	Trim the edge flush with the top of the mold. If the edge is thick enough then go to the next step. If the edge is not thick enough then allow it to cool a bit and you may pour in more molten wax and thicken it up. If the edge is too thick, put it back into the wax pot and make another one. g.	When the puddle in the bottom of the shape cools enough (it will turn from glossy to mat, and when touched should not give too much), you may carefully pour cold water into the wax shape so it cools faster. h.	Remove the shape and if the mold is going to be used by other students, put it back into the water so it remains saturated. 2. Connect the two shapes. Connect the two shapes by welding them together with a hot knife and wax. This will create the basic shape for your sculpture. a. Think out your idea for the sculpture. The purpose of this part of the assignment is to experiment and learn the techniques of working with wax, so feel free to alter the two shapes in any way you want. b.	Connect the two shapes. 1. Use at least two cast forms. 2. Make and use wax sheet to add to your sculpture. 3. Use additive and subtractive techniques. a. Use the techniques we discuss in class and/or improvise your own to create sculpt your sculpture. b. Experiment with textures, adding and subtracting material, casting additional small pieces to add to it (we will learn a method of making molds of small objects using a material called Alginate), etc. c.	Be creative, I expect you to take an idea and run with it. 4. Spruing – Wax bars are attached to the sculpture which, when invested and burnt out will leave negative cavities for the metal to be poured in. a. Talk with the instructor about how to sprue your bell – each sculpture may require a different method of sprueing. b. 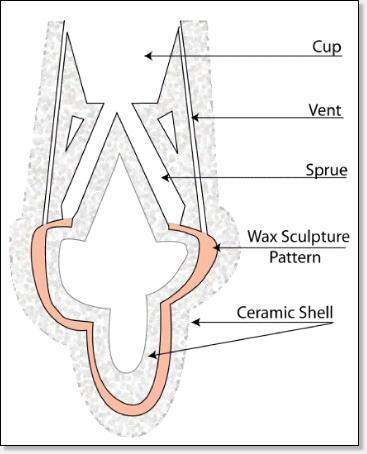 The most common sprueing method for a sculpture (or other hollow form) is shown in the diagram below. The metal is poured into the cup, flows down the sprues and into the cavity where the wax sculpture pattern was. The vents allow air to escape the mold when the metal is poured in. 5. Investing – The wax sculpture pattern is now invested in ceramic shell. The wax pattern is dipped multiple times in liquid slurry and then dusted with a silica powder and allowed to dry in between dips. You will dip the wax pattern 11 times creating a coat of dried silica on the wax about 1/4-3/8” thick. You have to let each dip dry at least 45 minutes to 1 1/2 hours, this process takes a minimum of one week to complete. 6. 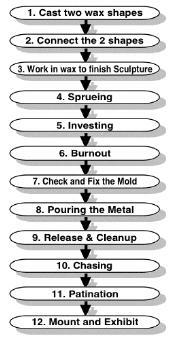 Burnout – The mold placed upside down in a kiln and is heated to 1500°F. During the process, the wax melts out and the shell is fired and hardens. 7. Check and fix the Mold – Check the mold for cracks and fill the vent holes that you drilled in the mold with tenix. Fix any cracks. 8. Casting – The mold is heated up to 1000°F and molten bronze is poured into it. 9. Removal of the Shell – Once cool the shell is removed using hammers, chisels, dental tools, and a sandblaster. This is not a quick process, especially if there is a lot of fine texture with small cavities. Allow for several days of work if your piece has a very textural surface or areas to trap the investment. 10. Chasing – Chasing is the process where the surface is progressively refined until the final finish is achieved. Allow several days for this process. 11. Patinating – A patina or coloring is applied to the bronze using chemicals. Practice first on some scrap bronze.